I grew up on the Perry Mason TV show and I had read a lot, but not all of the more than 80 Perry Mason Novels. When I saw the title, I had to check the book out. When I finished reading it, I combed the used books stores to buy a copy (as it was already out of print by the time I read it.) Unlike many other books on writing that I have read before and since that moment, this book was written directly from an examination of the plotting notebooks, the notes, and the diaries that Mr. Gardner left behind. The book documents his struggles and his life, not just how he wrote. Mr. Gardner’s notes made it clear that as an early writer, he was determined to turn his mind in to a plot machine—which was my goal as well when I discovered the book. To do this, he actually created a plot machine that he played with until his mind did exactly what the machine did. The plot machine was only a bunch of circle cut outs that had a spinner and plot elements on it. After playing with it and a few other elements (which I may blog about at another time) his mind was able to create the twisting plots. 9. Hero sets solution factors in motion or traps villain. The plot machine looks easy, but it isn’t. Nor, is it the end of how Mr. Gardner pulled his plots together. It is only one huge cog in his method that drove the rest. If you would like for me to blog more on this, please comment and let me know. If want to find the book (as I am reluctant to loan it out as my ex-wife loaned it once to one of her friends I never got it back and had to but another one at a hefty sum—per Amazon.com it sells for $71 to $125.00 as of today), look for “Secrets of the World's Best-Selling Writer: The Storytelling Techniques of Erle Stanley Gardner” by Francis L. Fugate and Roberta B. Fugate (Sep 1980). ISBN-10: 0688037011 ISBN-13: 978-0688037017 Publisher: William Morrow & Co You might be able to still get a copy at your library or through the interlibrary loan system (which is why I have given you the ISBNs and the publisher). Do you know the name Erle Stanley Gardner? Maybe not. It is likely you have heard of one of his famous protagonist: the famous Defense Attorney Perry Mason--known both in book and from TV as portrayed by Raymond Burr. Gardner was proclaimed to be the king of American mystery fiction. He was a criminal lawyer who filled his mystery masterpieces with intricate plots with more twists than a wood screw. Gardner wrote novels, short stories, radio dramas, and articles on forensics and travel. He published 134 novels and 15 non-fiction books under his own name and A.A. Fair, Kyle Corning, Charles M. Green, Carleton Kendrake, Charles J. Kenny, Les Tillray and Robert Parr. On Wednesday, we will post a blog on Gardner's "Theory of an Unstatic Plot" which helped turn his mind into a "plot machine." 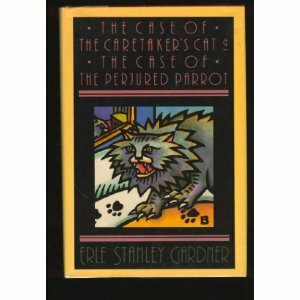 The Case of the Caretaker's Cat (1935) – "Charles Ashton is a cranky old caretaker with one friend in the world: a Persian cat. Samuel Laxter, his new boss, wants him to get rid of the feline. A simple case . . . on the surface. But when Perry Mason gets involved, there's suddenly more at stake. Like some priceless diamonds. A million dollars. And two gruesome murders. Only Mason with the invaluable help of Della Street and Paul Drake, can crack The Case of the Caretaker's Cat." The Case of the Perjured Parrot (1939) – "Fremont Sabin, an eccentric millionaire, is found murdered in his country cabin. The only witness: his pet parrot. The bird keeps saying, "Helen, put down that gun." But is a parrot's testimony valid in a court of law? And what's Perry Mason to do when he discovers that the dead man had two wives named Helen? In one of his most ingenious and entertaining cases, Perry Mason puts Della Street and Paul Drake to work to help solve The Case of the Perjured Parrot." How do you win? To enter the contest, simply leave a comment or question on The Writers' Lens blog between now (Nov. 28) and midnight December 3, 2011. Please include your email so we can reach you if you win. The more comments you leave, the greater your chance of winning the contest. If you refer others to The Writers' Lens who mention your name in their comments, we'll enter your name again in our random number generator along with theirs, also increasing your chances at winning! The winner will be chosen after midnight on Saturday and the announcement made on Sunday, December 4th. Good luck and comment often. Thanks in advance for your comments, and good luck! If you’re reading this and not out shopping on Black Friday, don't despair. Instead of fighting those crowds, take a few minutes to see if any of these children’s books may help round out your holiday gift list. I added some of these to my shopping list while I was at the Nov. 12 conference in Chicago for the Society of Children’s Book Writers and Illustrators (SCBWI). A Dog’s Way Home (age 8+) by Bobbie Pyron -- a girl and her dog are separated in an accident: told from her perspective and the dog's. Divergent (teens) by Veronica Roth – If your kids liked Hunger Games, they’ll probably like this dystopian novel, too. I know I did. This Girl Is Different (teens) by JJ Johnson – A homeschooler attends high school her senior year and finds social justice requires a large dose of personal responsibility to keep from running amok. And I learned about some young adult books to keep an eye out for in January 2012: The Way We Fall by Megan Crewe, Under the Never Sky by Veronica Rossi, Teen Boat by Dave Roman & John Green, and Lions of Little Rock by Kristin Levine, and a July 2012 release, Insignia by S.J. Kincaid. Recently I had the opportunity to meet New York Times bestselling author John Lutz at a lecture offered by the St. Louis Writers Guild. I didn't miss the chance to pick up a signed copy of SERIAL, his new Frank Quinn novel. "The killer becomes the hunted...She was gagged. Violated. Tortured. Nailing the killer is priority number one and only the best will do--that means Frank Quinn. And Quinn wouldn't want it any other way. Because he recognizes the victim. Years ago, as a homicide detective, he saved her young life. Now the hunt is on, and deep in his gut, Quinn welcomes it. he knows he's seeing the work of a truly twisted serial killer. Except it's not the ritual weapon that makes this killer so disturbing. It's who he kills--and how he makes them suffer..."
John Lutz is the author of more than 40 novels and over 200 short stories and articles. His SWF SEEKS SAME was made into the hit movie SINGLE WHITE FEMALE, starring Bridget Fonda and Jennifer Jason Leigh, and his novel THE EX was made into the HBO original movie of the same title, for which he co-authored the screenplay. To enter the contest, simply leave a comment or question on The Writers' Lens blog between now (Nov. 21) and midnight Nov. 26, 2011. Please include your email so we can reach you if you win. The more comments you leave, the greater your chance of winning the contest. If you refer others to The Writers' Lens who mention your name in their comments, we'll enter your name again in our random number generator along with theirs, also increasing your chances at winning! The winner will be chosen after midnight on Saturday and the announcement made on Sunday, Nov. 27. Congratulations to Janet Bettag, winner of our Nov. 14 giveaway, a signed copy of Diana L. Driver's guidebook, THE MAYA: PEOPLE OF THE MAIZE. Check back tomorrow for another giveaway! For the Reader: What is a Space Western? Why is it a subgenre to be taken seriously? Space Westerns takes the idea that space exploration and colonization will be similar to the taming of the Old West. It’s settings may have dusty old towns (Star Wars’s Mos Eisley is great example). There may be horses or other beasts that are used for transportation. There may be “wagon trains,” bank hold ups, train heists, civil wars (as the story or as the background), saloons or cantinas and more. There are many critics in the science fiction genre who see the Space Western as nothing more that “using old furniture in a new location,” or as a style of work that shouldn’t be taken seriously. I disagree. Mankind has a nasty habit of repeating history—the good, the bad and the ugly. Let us look for a moment at many of today’s nations that have been built with the blood and sweat of what Americans call “Cowboys.” Obvious the United States is the first one to come to mind. Let’s add Canada and Mexico next. In fact, if it wasn’t for the Mexican’s and their culture, there may not have been an American Cowboy. The Americans who settled in west had many of the “Cowboy” skills taught to them by the Vaquero. My disagreement doesn’t end with just the nations in North America. All of the countries of Central America and South America have been built on the same type of sweet and blood and “taming of the frontier” as Canada, Mexico and the United States. Furthermore, so have countries such as Australia and New Zealand. In fact there are some other nations that can fall into this list. In these countries, the people developed a “western” type of society. It was different by degrees in each land, but there was commonality of personality that existed—a fiercely independent, self reliant, can do person who lived on the dream of a better world—an escape from a change in culture, slavery, or the coming of the mechanized society where machines replaced people and horses—on a often hostile frontier facing animals, disease, storms, and hostile indigents who were threatened with the loss of their freedom, land, religion, way of life, and very existence. If mankind continues to repeat history (which we will) and if we go out to the stars (we have to or die on Earth), then yes, I expect to see some kind of frontiersman/cowboy. He may not be sitting on a horse. He may not engage in Hollywood style gunplay. However, the personality will still exist. The frontier will not be antiseptically clean or without the conditions that was seen in the old frontier—in fact I would be highly surprised if those conditions are not somehow magnified. Maybe I am wrong, but the genre of Science Fiction is the exploration of what may be. In that exploration is the exploration of the frontiers of reality and what lies in our imagination On that stage, the Space Western explores what it means to be human in a universe that is far from tame. It's Monday--time for another Writers' Lens contest! This week, I'm excited to share a signed copy of Diana L. Driver's guidebook, THE MAYA: PEOPLE OF THE MAIZE. It's geared toward readers interested in an overall view of the ancient Mayan culture. Topics include Mayan history, religion and social structure.You'll find examples of Mayan art, pictures and descriptions of their temples and glyphs. With Dec. 21, 2012, fast approaching, you'll want to check out Diana's fascinating overview of predictions about the end of the Fourth Age of Creation, not only from the Maya but from the I Ching, Edgar Cayce, the Hopi nation and other sources. "The Maya created a civilization based on terror and human sacrifice and yet managed to excel in the arts, writing, mathematics, astronomy and the building of temple structures that rival the Egyptian pyramids. However, by the time the Spanish arrived, most of the great Mayan cities had been abandoned and reclaimed by the jungle. Why did this happen?" Learn about the author, Diana L. Driver, in her Sept. 1 interview on The Writers' Lens. To enter the contest, simply leave a comment or question on The Writers' Lens blog between now (Nov. 14) and midnight Nov. 19, 2011. Please include your email so we can reach you if you win. The more comments you leave, the greater your chance of winning the contest. The winner will be chosen after midnight on Saturday and the announcement made on Sunday, Nov. 20. Congratulations to Kathleen Kayembe, winner of T.W. Fendley's Nov. 7 giveaway of a signed copy of her debut historical fantasy novel, ZERO TIME, and a full Mayan astrology report from www.onereed.com. Don't forget to check tomorrow for our next giveaway! This is for the Readers: What is this Steampunk Stuff? Soyou‘ve met the contributors and received some great writing advice, but now it’s time for a little something for the readers. I thought I would help the readers out there with an explanation. My favorite way to answer this question – “Steampunk is Victorian What If.” Steampunk is just like it sounds, steam technology extrapolated to fantastic possibilities, with a bit of a punk edge. It can take place in the past, as mine does, in some distant dystopian future, or even some Neo-Victorian alternate dimension that sounds so much cooler than our present 21st century world. It’s not just about the technology, there are also gaslight romances, nature vs. technology showdowns, even zombies, or my personal favorite – it’s about the brass! There are a few iconic hallmarks that are universal. Remember Rube Goldberg – his crazy complex devices have inspired many Steampunk devices. Dieselpunk – includes the internal combustion engine. Clockwork, Clockpunk, or Lacepunk – focuses on technology before the steam engine. Cyberpunk – includes computers and other “modern” technology. Gaslight Romances – focus on the dark, foggy streets of European Cities. Steamgoth – tends to be darker. Westernpunk – a western with crazy technology. Edwardian vs. Victorian – which is a choice of time periods. 20,000 Leagues Under the Sea by Jules Verne – We have to start with the original Steampunk novel. Published in 1864 it set the tone for the entire genre. I’m querying agents and have my fingers crossed. There are so many more novels that I could never mention them all, to find more I would recommend the numerous websites and blogs dedicated to Steampunk. That’s the end of my Steampunk introduction; I hope you enjoy its vast universe. I wanted to also point out that it is the eleventh day, of the eleventh month, of the eleventh year. I like numbers and given T.W. Fendley’s post about Mayan Astrology, I thought I’d bring attention to it. One last thing, Happy Veterans Day! The Writers’ Lens would like to honor all men and women who have served in our nation’s armed services. We thank you for your service, your sacrifices, and want to express that you are always appreciated. Labels: book, Brad R. Cook, movies, readers, Steampunk, What is steampunk? In keeping with this week’s Mayan astrology giveaway, today I’m focusing on how to research sky events. Even when you’re writing fantasy, it’s important to get the facts right. It’s not always easy to accurately describe the phase of the moon or the timing of a total eclipse, whether your story takes place five years in the future or a few thousand years in the past. But to get the details took more work. 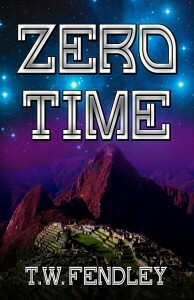 For one thing, my book ZERO TIME is set in Peru, and the sky doesn't look like it does in Missouri. That’s when I came across www.astronomy.com and its online Star Dome (Track more asteroids and comets…View Saturn, Jupiter, and their moons as you'd see them through a telescope.) and Star Atlas (The interactive Star Atlas lets you pan around and zoom into the 24 full-color maps originally published in Astronomy's Atlas of the Stars.) Needless to say, I got the paid membership so I could see everything. You can change your viewing location and the dates—from the future to the past! You can even check eclipse dates 3,000 years ago. On the discussion board, you can pose specific questions. I’ve also been interested in sun cycles for about as long as I can remember—sunspots, solar flares, solar wind and magnetic fields. You get the picture. 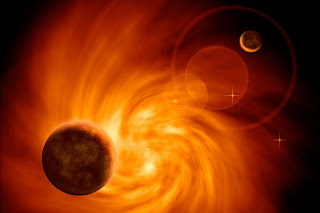 If you aren’t a scientist, how do you find out how long it takes for the X-ray particles released in a solar storm to reach the Earth or the chemical composition of the solar wind? Check out Stanford SOLAR Center’s FAQs: http://solar-center.stanford.edu/FAQ/index.html Apparently I should’ve learned all of that before I went to college. Sigh. Do you have a favorite research site for sky events that I didn't mention? I'd love to hear about it so I can add it to my list. For this week’s giveaway, we have two "grand prizes," but everyone's a winner with a FREE Mayan astrology reading. We’re leaving the literary world and delving into secrets of the cosmos. Are you with me? For years, I’ve had a passion for astrology and Mesoamerican culture—that’s the Mayans and Aztecs. So, you can just imagine how excited I was to discover How to Practice Mayan Astrology by Bruce Scofield and Barry C. Orr! Ever since I learned about Mayan astrology, I kept picturing a studly Mayan guy with huge jade earplugs leaning over a red-robed priestess and saying, “Hey baby, what’s your sign?” You won’t see that scene in my just-released historical fantasy novel, ZERO TIME, but one of the characters does practice Mayan astrology. From a layman’s perspective, the Mayan Day sign is like your Sun sign in Western astrology. What I like is that two people who have the same Sun sign usually have different Day signs, which just seems more accurate. For instance, my fellow Writers’ Lens contributor Brad Cook and I are both Leos, born one day apart (Aug. 12 and Aug. 13), though I’m about a century older. (Maybe it just feels that way?) His Day sign is 8 Ocelot (Maya: 8 Ix) while mine is 8 Flower (Maya: 8 Ahau). This brings me to how everyone’s a winner in this giveaway contest, thanks Scofield and Orr. Just go to www.onereed.com and click “FREE Sample report” on the Maya-Aztec Astral Report page. It asks the standard questions: your name, birthdate and email address. To make things more interesting, if you’d like to see the real deal--your full Mayan astrology report that's a complete personality delineation about 10 pages long--leave a comment or question on The Writers' Lens Blog between Nov. 7 and Nov. 12, 2011. Please include your email so I can reach you if you win. To celebrate the release of ZERO TIME, I’m also including a signed copy in this giveaway! The more comments you leave, the greater YOUR chance of winning the contest prizes--your full Mayan astrology report AND a signed copy of ZERO TIME. The winner will be chosen after midnight on Saturday and the announcement made on Sunday, Nov. 13. Thanks for entering, and be sure to check out the rest of this week’s posts. I’m continuing the celestial focus on Wednesday with some research tips! The winner of the David Alan Lucas's October 31 contest is Jennifer Stolzer. Congratulations! She has won a copy of The Dangerous Book for Demon Slayers. Enjoy! Remember that tomorrow will be a chance to win another book.